The Big Dance Starts March 18th. Dont Miss Your Shot! The NCAA Basketball Tourney is one of the most viewed sporting event in the U.S. with over 180 million watching the tournament and more than 20 million viewers tuning in for the finals alone. 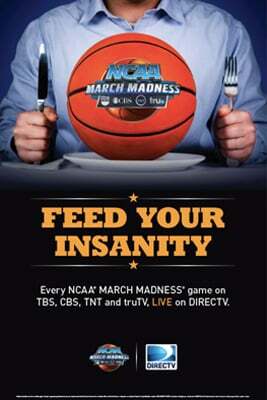 March Madness beats the Super Bowl in both viewers and ad revenue according to Forbes. A whopping 32 million people are expected to go to bars and restaurants in the U.S. to catch their favorite teams play in the NCAA Basketball tourney and you can show all 67 games in your bar or restaurant on DIRECTV. Take advantage of this huge opportunity to increase your revenue by drawing in NCAA Basketball fans to your bar or restaurant. 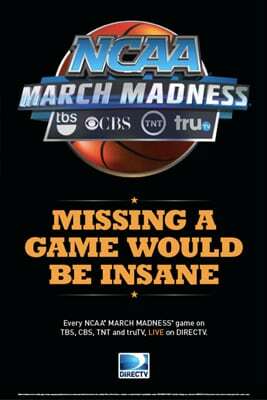 Get the March Madness Marketing Kit from DIRECTV. With Banners, Posters, Coasters and more, you can show your customers that they can come to YOUR bar or restaurant to catch all the games and draw in new customers too.